One of the things that caregivers of spouses say they miss most is everyday conversations with their loved ones. I understand that. Even in the early years after Kate’s diagnosis, conversation became more difficult. That’s because so much of our conversation involved specific pieces of information about other family members, friends, events, and other personal experiences we had shared recently and in the past. Because of her memory loss, Kate had less to talk about. One additional problem was how much more slowly she could process what I said. It required my repeating almost everything. I suspect that extra effort may have led to my talking less. As recently as a year ago, I would have thought we might not have conversations at all. The truth is that we spent a lot of our time together in silence. Since then Kate has talked considerably more than she did before. That is closely linked to the time she stopped taking Trazadone. So many changes take place over the course of this disease, I can’t be sure that the change in her medication is responsible for her talking more. It does remain a possibility. I can say that her talking more has significantly changed the quality of our lives, and I am grateful for that. There is another possible explanation for the increase in her talking. It was shortly after eliminating Trazadone that I read The Dementia Handbook in which the author, Judy Cornish, presents her ideas about rational and intuitive thought processes. She argues that caregivers need to focus on what people with dementia can do (things that involve intuitive abilities) rather than worrying about what they can’t do (things that involve their rational abilities). If you are a regular follower of this blog, you are well aware this has had a big impact on the way I approach caregiving. It helped me understand why Kate and I have gotten along so well. We had followed her advice without even knowing about it. Once I became aware of her ideas, I began to apply them with greater intentionality. Now, I look at almost everything she and I do with a conscious effort to pick up on her intuitive abilities. As many people say, I try to “live in her world” not mine. What that means for conversation is that I support Kate’s ability to talk about feelings as opposed to facts. This narrows the range of things we talk about, but I find it rewarding to be able to converse with her again. I have every reason to believe that she is enjoying herself more because she is playing a more active role in our conversations. So what do we talk about? Well, the kinds of things I have reported previously. They fall into several categories. She has strong feelings of respect and admiration for her parents and her extended family. She talks more about her mother than anyone else. She also has feelings of gratitude about her life with her family growing up and her life with me. She has feelings about others who have been less fortunate than she has been. 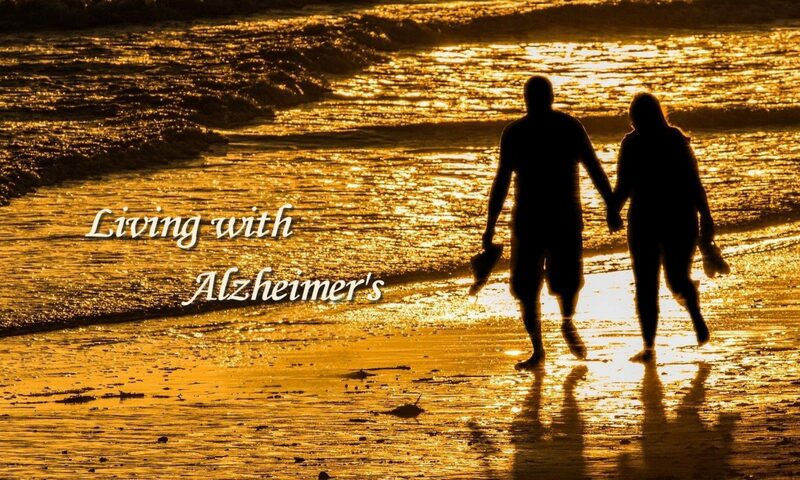 She is kind-hearted, something that seems to have increased since Alzheimer’s entered our lives. This leads her to say more good things about people she encounters, friends and strangers alike. Our conversations are like a litany of expressions of these feelings, and they occur over and over again. As I reflect on what I have said, I believe that almost all of the special moments we share involve these kinds of conversations. I like seeing her happy, and she is very happy when she expresses her feelings on these topics. That is why we have so many good days. The feelings she has are strong feelings. They endure. It makes me hopeful that we will be able to continue our conversations for a good while longer. I suspect that those who haven’t spent time with someone with dementia might think it strange or boring to engage in conversations like this. I look at it the way most of us do when talking with young children. Parents and grandparents normally love to enter the world of a child. I feel the same way about entering Kate’s world. Thus far, it doesn’t involve a lot of “make believe.” Almost all of our conversations relate to real feelings about real people and experiences. More importantly, I share Kate’s feelings, and I believe the expression of these particular feelings are healthy, even therapeutic, for us. They maintain our focus on all the positive things in our lives and not the negative and help turn what is ordinary into something special. That is one reason I say we have so many good days. Yesterday was another one. Her memory wasn’t much better than usual. The key was her engaging in conversation with me. We had a very simple lunch at Eggs Up. She had a chicken sandwich, and I had a Greek omelet, but it wasn’t the food or the ambiance that made it special. It was the simple pleasure of a husband and wife talking about little things that mean a lot to us. Once again, Kate was quite confused yesterday morning. It seems like this is becoming a regular pattern. Let me repeat that forgetting where she is, what my name is, and that I am her husband are not new. Two things are different. First, it is becoming more typical than before. Second, it seems like she is in a deeper state of confusion. At least, that is the way I interpret her facial expressions as well as things she says. Yesterday she repeated her questions about my name, our relationship, and her name multiple times very close together as if she didn’t even hear me the first time (second time, etc.). She was apparently “feeling” a sense of confusion or disorientation that disturbs her. Normally, when she asks my name, she does so very naturally without any special emotion. She doesn’t seem disturbed at all. I realize “disturbed” doesn’t provide a very precise way of telling you how she felt. I use it to convey a feeling that goes from only “mildly” disturbed to “seriously” disturbed. Last summer when I first saw her this way, she was “seriously” disturbed. What I saw yesterday morning was mild compared to that. It might be better described as “puzzled.” She knew something was wrong and couldn’t understand why, but she was not distressed. This was neither a panic nor an anxiety attack. The fact that I was able to relieve her discomfort so quickly is a good indication the situation was not as dire as it has or could have been. Once she had gone to the bathroom and dressed, I took her into the family room. I picked up the “Big Sister” album and showed her the cover picture. She smiled immediately and commented on the smiles of her and her brother. I asked if she knew who they were. She said, “He’s my brother. <pause> What’s his name?” I told her and said, “And who is that with him?” She said, “Me.” I directed her to the sofa and suggested we look through the book. She opened the first page with the introduction to the book and started to read it. She struggled, so I read it to her. She continued to try to read it herself but asked me to help her with most of it. This is another case of knowing that her difficulty must be from her Alzheimer’s and not her actual vision. I would say she spent at least five minutes on that page. I reminded her that this was a gift her brother had made for her. She got tears in her eyes. She has looked at the book many times before. I don’t recall her getting that emotional and so quickly. At this point, the only photo she had seen was the cover picture. When she turned the page, she was able to see photos spread across two pages. She must have spent ten minutes looking them. She revisited each picture several times. Almost every time she asked me to tell her who the people were. The sitter came in while she was on the second page. I suggested to Kate that they look at the album together. She liked the idea. When I said I was about to leave for Rotary, Kate wanted me to stay. She somewhat grudgingly relented but without a fuss. I’m sure she was engrossed with her the pictures as soon as I was gone. At 3:30, I had an appointment with my ophthalmologist, also Kate’s. I asked Cindy to meet me with Kate at the doctor’s office. That worked out well. From there we went home for a short break and then to dinner. Kate was doing perfectly fine. We closed out the day at home watching a YouTube video of a BBC PROMS concert celebrating the music of Rogers and Hammerstein. It was one more successful day after having to address an emerging problem in the morning. I know this won’t last forever. We’ll enjoy it while we can. Yesterday we paid a visit to see Ellen Seacrest, one of our longtime friends who lives in a memory care facility in Nashville. It is now three and a half years since she had stroke. It affected her mobility and her speech. For a while the speech improved, but it has been much worse since having a couple of seizures a year ago. During our last two visits we could only understand about 25% of what she said. Yesterday it was even less. For the first time, that may have had an impact on Kate’s response to her. We met in the activities room. Kate noticed some jigsaw puzzles on a shelf and brought one to the table where we were sitting. She never opened it, but she never seemed as engaged in the conversation as she had been in the past. It also seemed like Ellen directed more of her comments to me. That could have made Kate feel less involved. On our next trip, I think I will make more of an effort to excuse myself for a few minutes and let them have some private time. I am sure Kate would take more initiative if I were not in the room. After we were there about an hour, I brought out my iPad. Ellen was enthusiastic about viewing musical performances as we have done for the past eight months or so. Apart from her career as an ETV producer, Ellen directed her church choir for almost forty years. I selected videos of the Wartburg College Choir in Lincoln, Nebraska, thinking that might be of special interest. I was right. She loved it. What’s more, Kate did as well. They were seated side-by-side with eyes fixed on the iPad. It was hard for Ellen to express her feelings except by the expression on her face, but she did convey that she liked the pageantry of some of the videos. Several of them featured the choir’s entry as they marched down the center aisle to the choir loft. Several of the pieces were accompanied by a small orchestra. I don’t think she has been to church since her stroke, so it was an especially meaningful experience for her. I am glad we got to share it with her. After we left, we went to dinner. I was reminded of how closely I need to watch Kate when we are out. We were seated near the restrooms, but I always walk her to the door and often open it for her. Then I wait near the door for her to come out. As usual, it took quite a while for her to finish. I noticed others who had entered and come out. I went to the door and pushed it open enough to see Kate was standing at a sink washing her hands. A woman and her daughter were at the sink beside her. I closed the door assuming she would be out shortly. The mother and daughter came out, but Kate didn’t. I went back to the door. This time I knocked and slowly opened it. Kate was walking to the door. I don’t know what happened, but she apparently didn’t remember where the door was. She thanked me and showed no sign that anything had happened. It reminded me of times when I have lost and found her. She was very calm. When we got to our table, I showed her where she had been sitting. That seems a simple thing, but she never knows where to sit. She often doesn’t understand when I show her. As she started to sit down, she said, “Where is my husband?” I said, “Right here.” She looked at me and realized she hadn’t known I was the one ushering her from the bathroom to her seat. After dinner, I was leading her to the exit when I got too far ahead. I looked back. She was about fifteen feet behind and looking for me. I walked back and led her out. She looked at me and said, “Where is my husband?” I looked at her, and she realized again that I was the one holding hand to the car. In both of these instances, I was struck by two things. First, was the fact that she said “my husband.” She is far from completely forgetting that. It is simiar with my name. She still occasionally calls me Richard when she needs something. Most of the time she just says, “Hey.” (That reminds me that the sitter told me that on Friday, Kate asked, “Where is my daddy?”) Second, these were clear instances of a problem with her sight that relates to her Alzheimer’s and not to her cataract. We know that she can now see out of both eyes. When she misses things, it can’t be a problem with vision. I sense that we are going through another transition when she wakes up. I’ve previously noted that she is often confused, but the past few days she has seemed more confused than usual. She hasn’t remembered my name or relationship. It is not unusual for her not to know that she is at home, but that has been more puzzling to her when I tell her. It’s like she is in a deeper fog than usual. I am settling into telling her I am her husband if she asks about our relationship, but I am not intending to dispute her if she thinks I am her daddy. I just don’t want to create any unnecessary problems for her. She is still alert enough to recognize that she should know she is in her own house and that I am her husband. Sometimes it can be difficult to know exactly what to say. On any given day Kate may express confusion, clarity, sadness, and joy. My own emotions vary a lot as I observe each of these things. That was true on Thursday of this week, but, overall, it was another good day. Kate has always been a little slow to wake up. As her Alzheimer’s has progressed, she has been more confused. As we move through each day’s activities, she improves. I often find that she is at her best in the afternoon and evening. I have a thought about why. I have been using the pixels on a computer screen as a simile. When we look at pictures on the computer they look beautiful. That’s because all the pixels are working as they should. Let me explain how I apply that to Kate’s behavior. Let’s take a step back. Remember tabula rasa (the idea that we begin life with a blank slate)? Upon birth babies immediately begin to fill that blank slate. The more experience and education we get the more we fill the space. To me that’s like adding pixels. For many reasons, some people have more pixels than others just like our electronic devices. The “pixels” in the brains of people with dementia are damaged. At first, it’s just a few that are not working, but ultimately virtually all of those pixels that relate to our rational abilities fail to work as they did before. If I extend that idea to Kate’s behavior during a day, I would say that upon waking many of those pixels are not working well. As she wakes up and engages in more activity and conversation some of those pixels begin to work again. They may or may not work perfectly, but they work sufficiently to enable her to function reasonably well. Toward the end of the day they work best although she sometimes experiences overload. When that happens, she is confused again. With this in mind, let me take you back to Thursday. I got up with her a few minutes before 6:00 to go to the bathroom. She went back to bed, and I got ready for the day. She got up again at 9:45 and went to the bathroom. I thought she might want to get up, but she wanted to return to bed. At 11:00 when I went back to see if she would like to get up, she was awake. This time she was ready to get up. As I was helping her dress, she asked if I were her daddy. I said, “Would you like that?” She smiled and nodded. I said, “I’m your daddy.” Then she asked, “Where is my mother?” I said, “She’s in Fort Worth.” She asked her name. When I told her, she said, “She was a nice lady. People liked her.” I agreed. I can’t say what was going on in her head at the time, but she was confused. It seemed like she must have been wondering why her father wasn’t with her mother or where she was if her mother was in Fort Worth. That made me wonder if I was wrong about telling her that I was her daddy. Just before leaving the house for lunch, she said, “Yes, Daddy” when I told her I needed to put some drops in her eyes. I didn’t say anything. Once we were in the car, she said, “Are you my daddy?” I hesitated a moment and said, “Would you like me to be your daddy?” She said, “I can see you’re not going to tell me.” Then I said, “Would you really like to know?” She said she would, and I told her I was her husband. She is frequently surprised at this news, but this time she appeared shocked. My immediate thought was “Richard, you’re causing more problems than solutions.” It reminded me of what I’ve heard so many times. “Once you tell a lie, it leads to other lies.” I felt the deed was done and didn’t back away. I told her that we had met at TCU, fell in love and married in 1963. She remained confused for a couple of minutes (maybe less). Then she had forgotten. She called me daddy one more time before we got to the restaurant. After that, I had a sense that she knew that we were married. In fact, one time she said something about our being together a long time. Once we were home, I picked up one of her family photo albums. This was one that focused on her mother’s family. It had been a while since she had looked at it, and she responded enthusiastically. I looked over her shoulder as she went through a large portion of the album for almost an hour. I was pleased with two things. First, it seemed like she was showing less confusion as she went through the album. It was as though the accumulated impact of seeing the large number of pictures of people and places from her past was rekindling the connections in her brain. To me it was like lighting more pixels, but not all the connections came back. It was mostly her feelings and not the facts. For example, she still had trouble remembering people’s names and recognizing them as we went from picture to picture. It was not just her pleasure that I thought was striking. She also seemed quite alert and happy. She didn’t seem like the same confused person she was earlier in the day. It was like all those pixels were charged up and working well. Of course, they weren’t. Alzheimer’s has damaged her brain so much that at this point there is never a time when everything is working, but I am thankful for those moments when it appears to me and to others that they are. Yesterday someone I follow on Twitter reported a success he has had with a sitter for his wife who had told him, “She’s just like my sister.” I wish I could say the same about Kate and her two sitters. Her relationship with them seems to fall far short of that. It has been one year and five months since I engaged an agency to provide sitters four hours each Monday, Wednesday, and Friday afternoon. On the whole, it has gone better than I imagined, but there have been times when she wanted me to stay with her. That made it difficult for me to walk away. It was very much the way a parent feels when leaving a child at home, school, or a child care center. Recently, we have had more success, and it involves both of our sitters. We have had to replace three of the Monday sitters. That wasn’t because of any dissatisfaction. Each of them has involved health issues of the sitter or her family. The one we have now has been with us three times. Kate was asleep the whole time she was here on her first visit. Kate has received her warmly the past two times she has been here. The two of them seem to be getting along all right. The first visit they spent the whole four hours watching YouTube videos of musical performances. The last time they watched Fiddler on the Roof. I am optimistic that will continue to go well. We have been fortunate that the Wednesday and Friday sitter is the same one who started with us. I wouldn’t say that Kate thinks of her like a sister, but she is comfortable with her. Yesterday was a good example. When Mary arrived, Kate had just started looking at her “Big Sister” album. I suggested that she move to the sofa so that she and Mary could go through it together. Kate was happy to do that. When I told Kate goodbye, she didn’t express any disappointment. Her attention was focused on her album. I felt good when I left. When I got home, they were both in the family room. Mary was watching TV, and Kate was resting in a chair. Mary told me they had spent some time with the album and then they had gone to Panera for a while before coming back to the house. I had left the TV in our bedroom set on YouTube in case they wanted to watch videos, but they hadn’t done so. I was happy that they had amused themselves without my having to structure too much of their activity. They seem to have gotten along well. Kate didn’t say anything that would have made me feel otherwise. I haven’t ask Kate how things went with the sitter in a long time. She never remembers, but I am encouraged that she doesn’t show any signs of bad feelings about Mary. More importantly, when I see them together as they were when I left, I can tell that Kate is quite comfortable with her. I am still wondering when I might add extra help. Financially, there is no obstacle. We have already met our 90-day out-of-pocket costs for our long-term care insurance. The company will pay the total costs up to fifteen hours a day, but I don’t currently feel the need to have more time away. More importantly, I want to spend as much time as I can with Kate as long as we are able to enjoy doing things together. I should add that I do sense the effects of the increasing responsibility of Kate’s care. I am discovering things I have left neglected or totally forgotten. One of the things I wonder is whether the greatest help would be overnight or during the day. I am getting up at night with her more than in the past, and I don’t always get right back to sleep. I could easily see that having someone here overnight could be of benefit. That would probably mean our moving to separate bedrooms. I’m a long way from being ready for that, but I know that time will come. I’m not going to worry about it now. In the meantime, I’ll continue with the status quo. I’m happy with it.